Perhaps a forecast of my future green interest; I used to love the story of victory gardens in this book. By the end of WWII, Molly and her family would have been part of the 20 million homes providing 40% of the produce consumed in America. 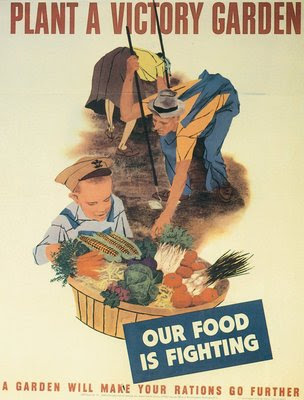 Victory gardens were used to reduce the pressure on the public food supply brought on by WWII. Heralded by Eleanor Roosevelt, victory gardens indirectly helped the war effort but were also considered a moral boost; gardeners could feel empowered by their contribution of labor and rewarded by the produce grown. 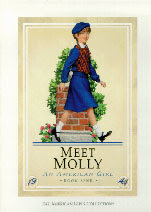 Today, I am captivated by the prospect of victory gardens for my generation of American Girls. Gardens today could help reduce our dependence of fossil fuels and issues of climate change. Moreover, I imagine that growing a garden could still provide the recipient with a moral and economic boost. And as Michael Pollan suggests in his New York Times article, “The Farmer in Chief” the white house could again set an example of change for the food system. There is a current of support for the creation of nation-wide gardens planted in high visibility places whether that be the “First Lawn”, school lawn or town hall.